On Sale Now! 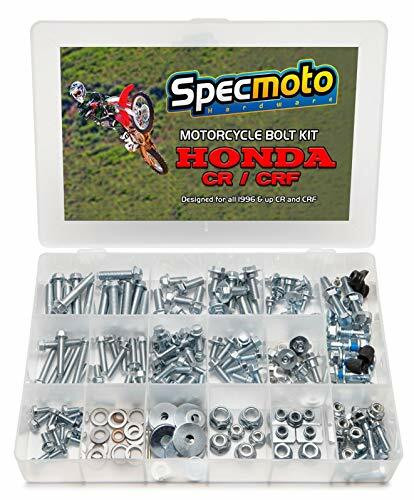 Save 7% on the Specmoto Hardware Honda Bolt Kit: CR/CRF Model Series Dirt Bike (1996-present) by Specmoto Hardware at N Online Agency. MPN: SM-CR/CRF-96BK. Hurry! Limited time offer. Offer valid only while supplies last. Specmoto's Honda Replacement Fastener Set is designed to help you maintain and restore your CR or CRF 2 or 4 stroke using exact OEM Honda matching fasteners. These OEM style bolts match exactly what came on your Honda originally and are designed to replace the most commonly needed fasteners all over your bike. Full range of Honda Factory fit flange bolts specific to CR and CRF. Bolts for all your plastics and bodywork, brake rotors for most models, fork pinch bolts, rear sprocket, engine left & right side covers, water pump, exhaust, and wheels. Spare set of hard to find aluminum HONDA bodywork bushings and spacers. And all the following: Crush/sealing Washers, SEMs bolts with built in Washers, Honda Fork Guard Bolts, Cotter Pins, Wheel Rim Lock and Valve Stem Hardware, Honda Radiator Shroud bolts, 17 compartment carrying case, and more. Compared to all the other Aftermarket bolt kits out there, this Specmoto kit is designed to give you the best bang for the buck. A selection of CNC bushings and most needed Honda style bolts in one package, all at an attractive price. You cant beat this deal anywhere. If you have any questions about this product by Specmoto Hardware, contact us by completing and submitting the form below. If you are looking for a specif part number, please include it with your message.